An egg is an oval body laid by the female of many animals. It consists of an ovum surrounded by layers of membranes and an outer casing. Most edible eggs, including bird eggs and turtle eggs, consist of a protective shell, the albumen (egg white), the vitellus (egg yolk), and various thin membranes. Every part is edible, although the eggshell is generally discarded. 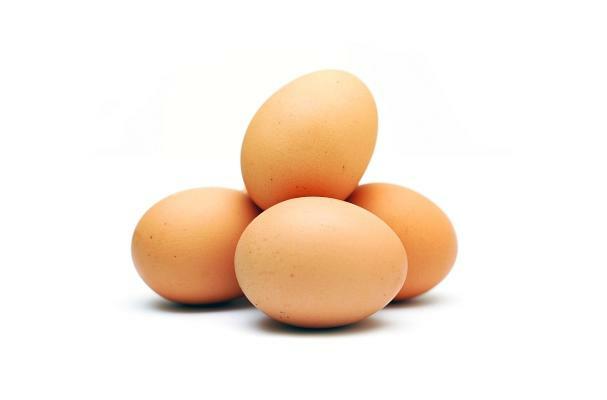 Nutritionally, eggs are considered a good source of protein and choline. Eggs are composed of a yellow yolk and translucent white surrounded by a protective shell that can be white or brown, depending upon the breed of the chicken. The shell's color is not related to the quality or nutritional value of the egg itself. Flavors: As with meat the flavor of eggs can vary according to the diet of the animal. In commercial chicken factories where the hens eat feed pellets both the meat and eggs will have the same bland flavor as compared to those which are raised in a more natural environment with healthier diets. Chickens that are 'free range' and are allowed to graze for their food will produce eggs with flavors that vary according to season. During the spring and summer months when they eat bugs and chlorophyll-rich grasses and weeds, bugs and such, the yolk will be more brightly yellow/orange and taste richer. In the winter months, when the chickens move indoors, their diets are a bit more restrictive (with less fresh grasses) and the egg yolk are less brightly colored. Nevertheless, a farm-fresh egg will be much more flavorful than a egg from a factory. Mouthfeel: The mouthfeel of eggs can range from silky to chalky, Depending on the way the egg is cooked. Choosing: Break the code. Near the "sell by" date there are numbers that represent a code. The first few numbers are for the packing company and the last three digits are the coded date the eggs were packed on. Here is how to break the code: January 1 equals Day 1, continue onward through the year and December 31 equals Day 365. For example, in "0967105" the "105" code means the eggs were packed on April 15th which is the 105th day of the year. Calculate the "sell by" date. This date is to be no more than 30 days from the packing date. The packing date must be within one week of the eggs being laid. If the eggs are stored properly they are typically good for 30 days after the sell by date. Check for cracks in the shell which could let bacteria in and contaminate the eggs. Select a size and color. There are Jumbo, Extra Large, Large, Medium, and Small eggs. The size varies depending on the breed of hen, what she was eating, her age, weight and environmental conditions. The eggshell color (white or brown) is based on the breed only. Choose the type of egg. Farm raised, cage free and free range tell the consumer how the hens were raised as compared to factory-raised hens. Standard white eggs have less restrictions over the feed compared to others like organic eggs. Organic eggs have no chemicals, animal products, hormones or antibiotics used in the hens' feed and the feed is also organic. Omega 3 eggs come from chickens fed an Omega 3 enriched diet (often with flaxseed). Vegetarian eggs come from hens fed feed containing no animal by products. However, in nature, free range chickens forage for plants and eat some insects. Pay for the eggs. The price will vary depending on the breed of hen, the feed and the entire process to market. Buy your eggs according to the health needs of you and your family. Some have less cholesterol than others or more vitamins and nutrients. Check if the egg is old by putting it in water--if it floats, it's old. Buying: You can buy eggs at your nearest grocery store, though your local farmstand or a neighbor with laying hens is the best place to find them. Procuring: Urban henneries are becoming popular in many US cities. In most cities one household is allowed up to 3 hens, but no roosters (for obvious reasons!). Excellent in a number of preparations: baked (quiche, frittata), poached, coddled, boiled (hard or soft), deviled, scrambled, etc.. Cleaning: It is not recommend that you clean the egg before you refrigerate it. The reason is that it will wash away the protective coating of the shell. Wash eggs in running water before you actually use it. Store eggs in the refrigerator where they will stay fresh for about one month. Do not wash them, as this can remove their protective coating. Keep them in their original carton or in a covered container so that they do not absorb odors or lose any moisture. Do not store them in the refrigerator door since this exposes them to too much heat each time the refrigerator is opened and closed. Make sure to store them with their pointed end facing downward as this will help to prevent the air chamber, and the yolk, from being displaced. Do not freeze eggs. Shopping for chicken eggs in a grocery store. Egg white coagulates, or solidifies, when it reaches temperatures between 144 °F and 149 °F (62.2 °C-65 °C). Egg yolk coagulates at slightly higher temperatures, between 149 °F and 158 °F (65 °C-70 °C). If a boiled egg is overcooked, a greenish ring sometimes appears around egg yolk. This is a manifestation of the iron and sulfur compounds in the egg. It can also occur when there is an abundance of iron in the cooking water. The green ring does not affect the egg's taste; overcooking, however, harms the quality of the protein (chilling the egg for a few minutes in cold water until the egg is completely cooled prevents the greenish "ring” from forming on the surface of the yolk). Cooking also increases the risk of atherosclerosis due to increased oxidization of the cholesterol contained in the egg yolk. History: The history of the egg as food runs mostly parallel with the history of people consuming chicken as food. Although it is uncertain when and where it began, the practice of raising chickens for food is ancient and so, subsequently, is the consumption of eggs as food, extending back to the times of early man. Eggs have always been a symbol of fertility and have been an icon of religious worship. To this day, there is still a lot of folklore surrounding eggs that is enjoyed by different cultures around the world. One of the most widely held food and holiday associations is that of the Easter egg. How the egg became associated with this holiday seems to have roots that are both biological and cultural. Before more modern techniques of poultry raising, hens laid few eggs during the winter. This meant that Easter, occuring with the advent of spring, coincided with the hen's renewed cycle of laying numerous eggs. Additionally, since eggs were traditionally considered a food of luxury, they were forbidden during Lent, so Christians had to wait until Easter to eat them-another reason eggs became associated with this holiday. Interestingly enough, the custom of painting eggshells has an extensive history and was a popular custom among many ancient civilizations, including the Egyptians, Chinese, Greeks and Persians.